I’ve loved teaching since I was a middle school science teacher all the way back in 2005 (oh dear!). But, as a Penn State graduate student, it can be tough to find ways to bring science to kids and even more difficult to get experience teaching a class at the university level. 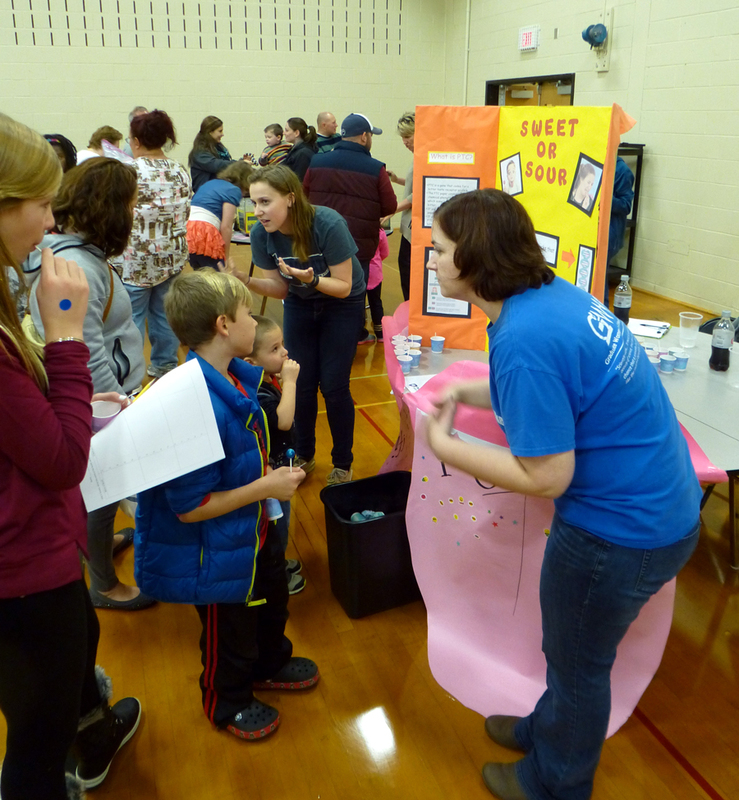 To reach kids with cool science education opportunities, many graduate students, including me, build outreach activities for different venues (which I’ve discussed on this blog before). But is there a way to meet both these goals, doing community outreach and gaining experience with more formal teaching, at the same time? In short, yes! About a year ago, I, and two friends who are also Biology graduate students, Allison Lewis and Zach Fuller, were being stereotypical graduate students and lamenting our lots in life. We’re supposed to be educators but the University won’t let us teach classes to get experience! Are we spending all this time doing outreach for nothing? Will anyone use our materials again? Why are we so whiny? Fortunately, bewailing the status quo can lead to good things if you get an idea for positive change. Zach, Allison, and I decided that the solution was to incorporate our outreach experiences into a class that would facilitate other students in conducting their own outreach from their own experience. We first went to work convincing the University to actually let us teach a class. It is harder than you might think to actually teach at a university: there are many hidden requirements I never knew about and lots and lots of paperwork. To cut through this red tape rehash, I’ll finish by saying that we A) went all the way to the Dean to get permission to teach an outreach class (with a major assist from some supportive Biology faculty) and B) got a workable budget, a room to host the class, and a spot with the University Registrar. 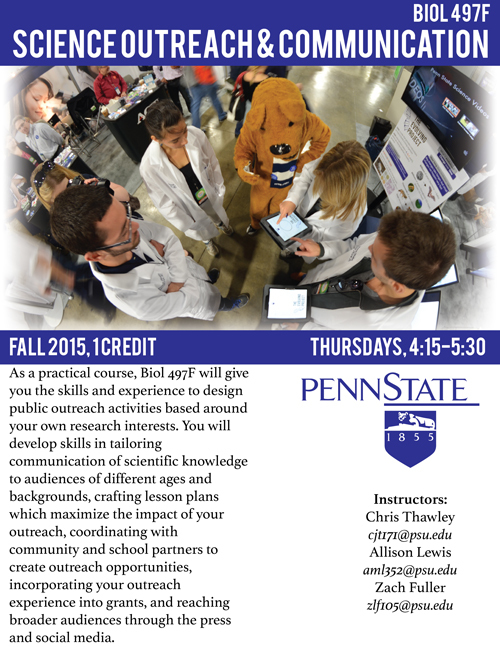 At long last, BIOL 497F, Science Outreach and Communication, a 1 credit class was born! The snazzy flyer for our class that we blitzed PSU with. Of course, we also needed actual students for our class. We made up flyers and became very familiar with the distribution of bulletin boards in University Park. We spammed listservs and spammed them again. We asked our friends for recommendations, got the emails of incoming students before they were on campus, and plied professors for the emails of students they would recommend to take our class. By August, we had 13 enrolled students: 10 graduate and 3 undergrads. These students came into the class with a mix of backgrounds including neuroscience, biology, entomology, anthropology and ecology. The first portion of our class focused on teaching a core set of skills: how to tailor activities to different age levels and audiences, how to design and plan effective outreach, and how to evaluate learning. We collaborated with professional educators from different University entities, including Mike Zeman from the Eberly College of Science Outreach Office and Larkin Hood from the Schreyer Institute for Teaching Excellence to bring their expertise to our class (thanks guys!). Our students worked in small groups to build their own lesson plans for an initial outreach activity and then presented those to the rest of the class for feedback. We worked as a group to provide constructive criticism and refine these activities to increase their focus and effectiveness. In the midst of this, we included several classes focused on other important science communication topics including writing for a general audience, the importance of outreach in grant-writing, and a panel discussion with professional scientists who are successfully incorporating outreach into their research and careers. At last, after much practice, cutting out of small paper shapes, tasting starbursts, and wrangling stick insects, the first outreach program (and major grade!) 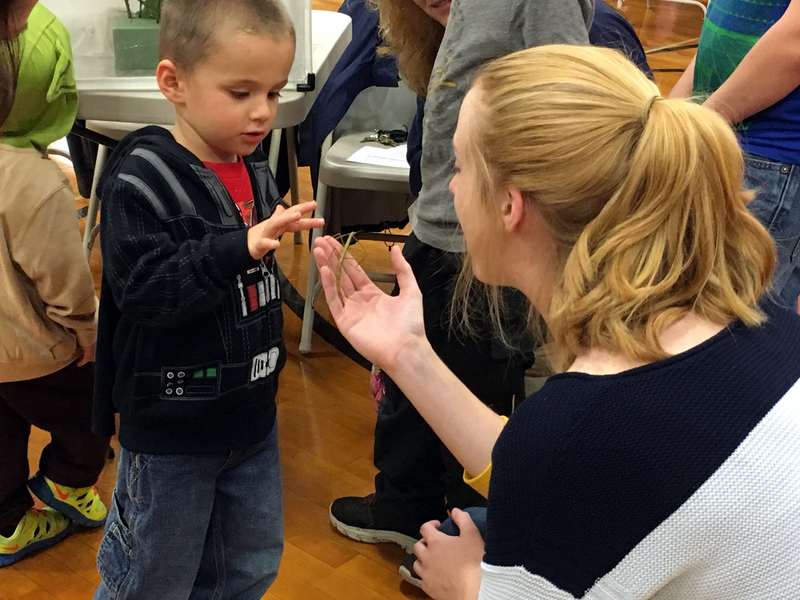 of the class arrived on November 10th as our students presented their own outreach activities at Exploration U at the Bellefonte Area High School. Exploration U is a biannual science fair run by the Science Outreach Office in which Penn State scientists and community groups present short, interesting activities about their research or other scientific topics for community children and their parents (hundreds of them at each event!). Some of the more dramatic activities include an inflatable planetarium, making ice cream with liquid nitrogen, a snake handling exhibit (not venomous ones!) and battling robots. 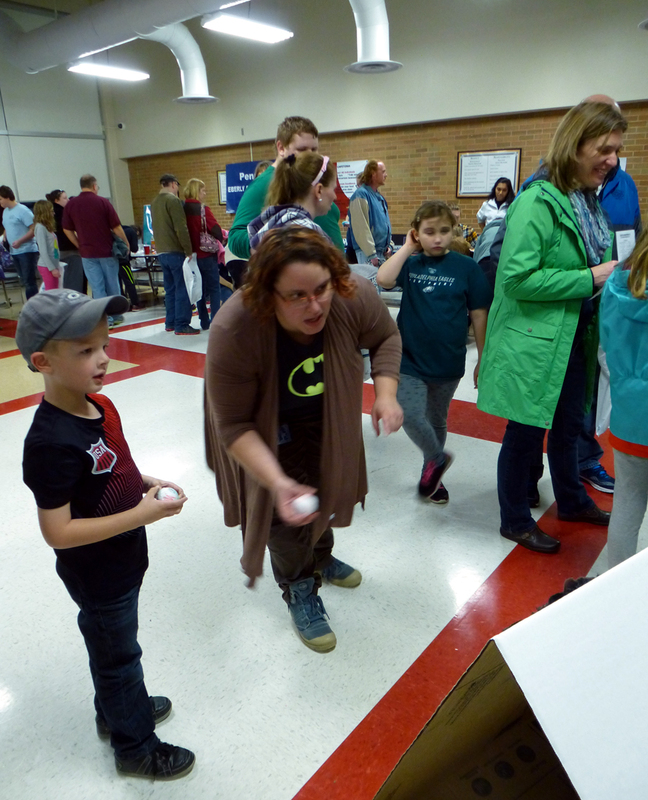 Five groups from our class spent the evening discussing various aspects of science with the crowds. Kevin and Arash showing off their Bug-O-Vision activity. Have you ever wondered how another organism experiences the world? 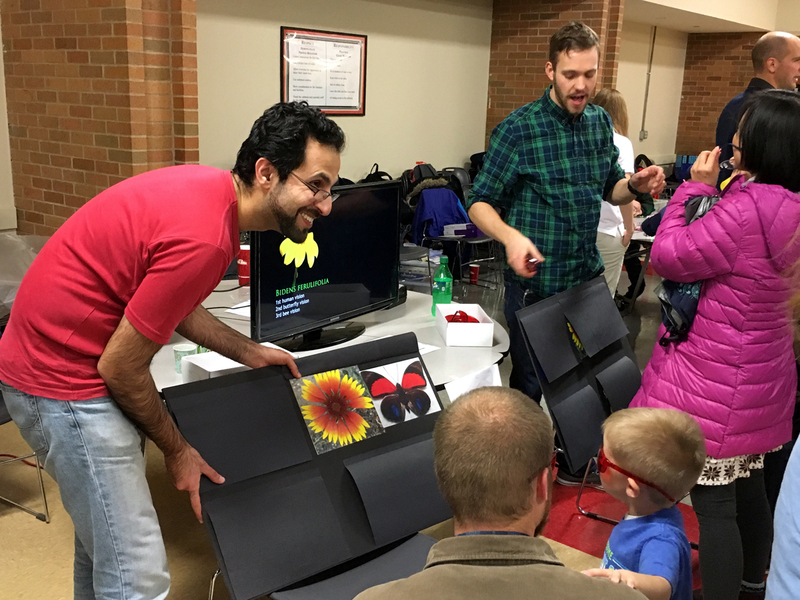 Arash Maleki and Kevin Cloonan taught attendees how insects perceive the world differently from humans. 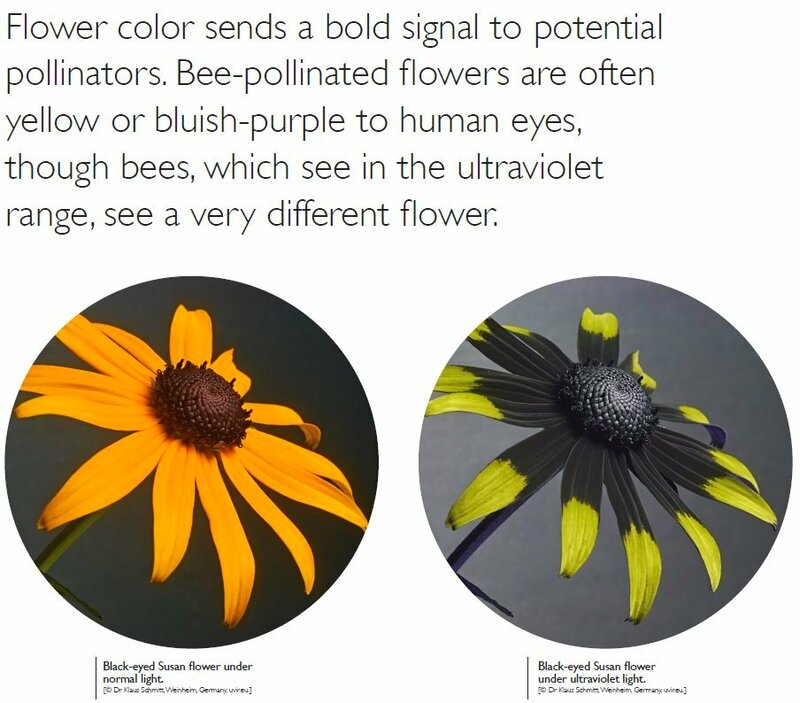 Using colored glasses, they described how insects see different parts of the spectrum from humans and how insects may see “secret messages” such as targets or directional signals on flowers that are not visible to our naked eyes. Check out lots of other awesome pics of how flowers look to different organisms at Dr. Klaus Schmitt’s blog. Cam Venable, Emilia Sola-Gracia, and David Stupski addressed the question of how plants are found everywhere when they don’t get up and walk (or fly or swim) like animals do. The answer is, of course, that their seeds do move, including via wind, water, and dispersal by animals. The kids loved an activity where they were able to make their own seed (with the aid of a little Velcro) and attempt to disperse it by tossing onto a passing fuzzy felt dog. Emilia shows a youngling the best way to “disperse” the seed he’s just constructed. Styles Smith, Kokila Shankar, and Christian John created an activity that emphasized how animals’ limbs are adapted for the environments that they inhabit. Kids worked to match the skeletal structure of limbs to the animals that used them and then designed their own animals with different types of limbs. At the end of the activity, kids drew the habitat that their animal creations lived in and explained how their creatures were adapted to it. Styles describes how to go about designing an organism while a participant and her brainy younger brother listen. Have you ever wondered why some folks just can’t eat their Brussel sprouts? Rebecca Coleman, Chloe Philip, and Chris Schmidt designed an activity explaining the heritability of taste, specifically focusing on why some are sensitive to bitterness (such as in those cursed sprouts) and others seem relatively immune. Kids and their parents tasted both sweet, sweet candy (Dum-dums) and a paper imbued with PTC, a chemical which tastes nastily bitter to a portion of the population. Chloe, Chris, and Becki used this experience as an entree to discuss how traits are coded for in our DNA and how these are passed between generations. As Becki and Chloe explain how traits are inherited, these kids are really developing a taste for science. Carolyn Trietsch and Sarah Shugrue focused on how insects are adapted for different environments via camouflage, which prevents unwanted attention from predators (or allows predators to set up ambushes for unsuspecting prey)! They created an activity for kids to match bugs to their natural backgrounds and find hidden, camouflaged insects, including several live Vietnamese stick insects (which fascinated adults as well as the kids)! A young Darth Vader stays on the Light Side by gently petting a stick insect. 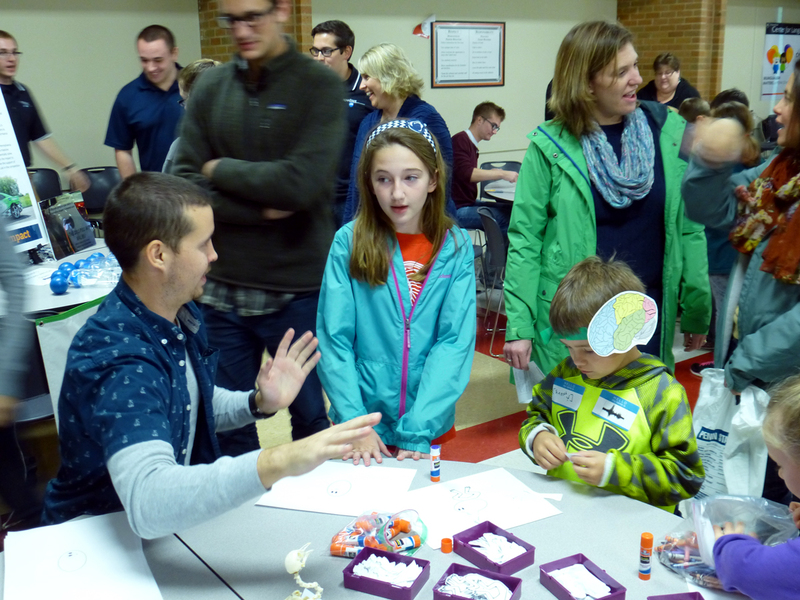 All in all, our class’ outreach night was successful as an educational experience both for the families who attended and the students in our class, who gained valuable experience. Moving forward, these students are designing and conducting their own independent outreach activities. Some lessons include: the use and importance of photography, including via drones (! ), in biological research at State College High, demos of insect life cycles at Mount Nittany Middle School, and a scientist-in-the-classroom visit via Skype to a Philly elementary school to discuss how awesome ants are! We’re proud of the creativity and dedicated work that our students have put in over the semester and are excited to see them continue to do outreach in the future. For me, this class has provided great experience: in designing a class from the ground up, learning to navigate bureaucratic pitfalls, and co-teaching a class with two other dedicated instructors. It’s also been inspirational to see the impact that a small but dedicated group of students can have in advancing scientific education. Looking forward we hope to make this class a yearly offering in the College of Science to encourage a growing culture of scientific outreach in the graduate student community. If you’re interested in seeing a syllabus for this class, here you go! Categories: Education and Outreach | Tags: adaptation, education, genetics, Insect, outreach, scicomm, science communication, seed dispersal | Permalink.